Today, the Jamberoo team stood up to the challenge and emerged victorious in the final round of the Trevor Bell Shield. We started the day 13 points in front of our nearest challenger, Port Kembla, and through some determined play the Jamberoo team managed to score the highest total of the day with 204 points. Second place went to Port Kembla with 189 points, followed by Kiama 188, Wollongong 177, The Links 169, The Vale 161 and The Grange 145. This result is the second time we have won the Trevor Bell Shield (last won in 2015) since it’s inception in 2010. The Shield will be engraved tomorrow and will hopefully be on display in the Golfer’s Lounge on Saturday. Individually, our players were all superb today and managed to fill 5 of the top 10 positions in the individual competition. It seems appropriate that our two best performers on the day were also the two best performers in the recent A Grade Club Championship. Arthur Bosanquet was our best today and he scored a magnificent 39 points to finish in second place on a countback, and his playing partner George Vlatko came in fourth position overall with 36 points. Fifth position went to the ever consistent Peter Francis (34 points) and in equal seventh position came Mick Burton and Brian O’Hare both on 33 points. 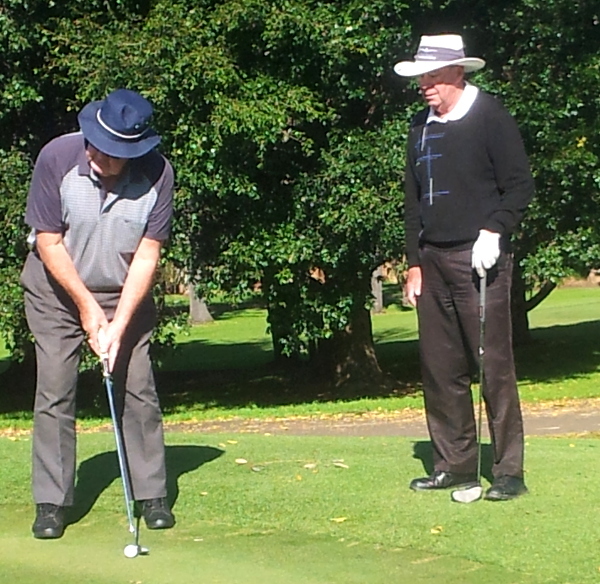 Ian Unsworth had our final counting score with 29 points, followed closely by Geoff Reynolds and Don Thompson. I would like to thank both Phil Gosling and Greg Seymour for their help before the comp started and for providing team encouragement during today’s round. Also, thanks to Dave Ransom for his last minute dash to Kiama to purchase the winners vouchers. All players are to be congratulated for their participation during the year and it was unfortunate we could only nominate 8 players for the final round because all of our team members contributed throughout the year. REAR: Peter Francis, Arthur Bousanquet, Ian Unsworth, Don Thompson, George Vlatko, Geoff Reynolds, Chris Goodwin. FRONT: Mick Burton, Greg Seymour, Brian O’Hare. Fantastic. Congratulations to all involved.